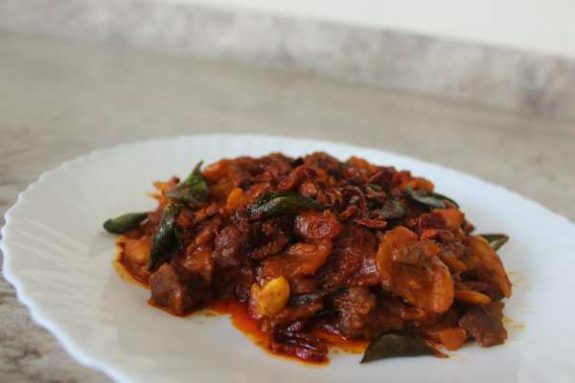 Jack Fruit Beef Mix is an old traditional Kerala recipe. It is very delicious and unique combination. 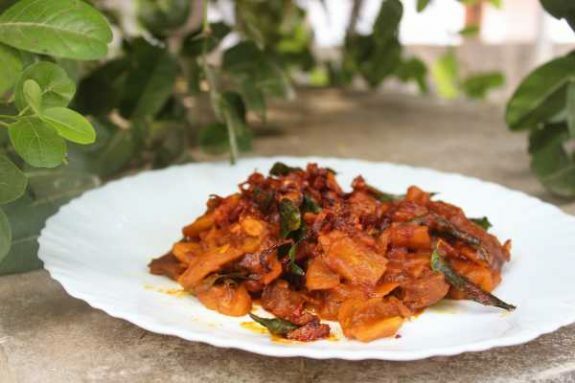 Raw jack fruit is mostly used as a vegetable across the country to make stir-fries and curries. 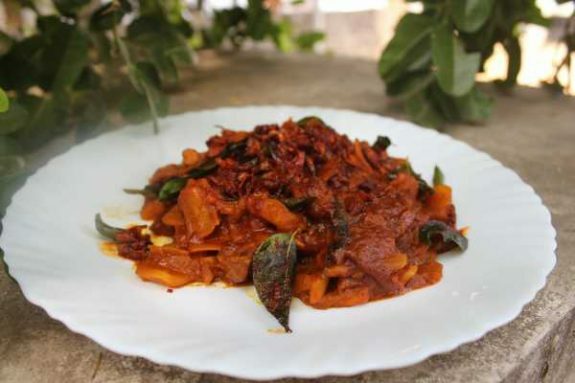 The percentage of soluble fiber in jack fruit reaches its peak at its raw stage. Jack fruit is known as the jack of all fruits. It is a rich source of vitamin, minerals, phytonutrients, carbohydrate, electrolytes, fiber, fat and protein. This fruit also contains calorie but no cholesterol or saturated fats. 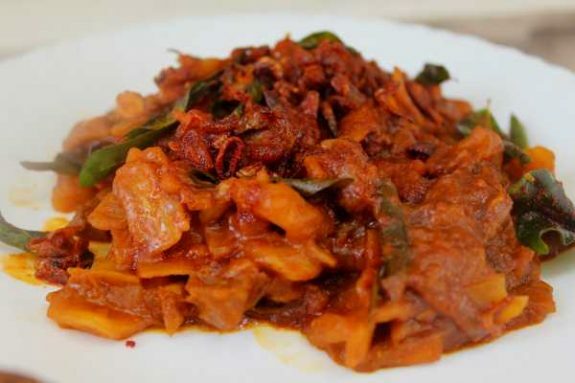 Jack fruit is loaded with carbohydrate. It is a rich source of simple sugar like fructose and sucrose that gives instant energy. Unlike ripe jack fruit, raw jack fruit is great for diabetes. 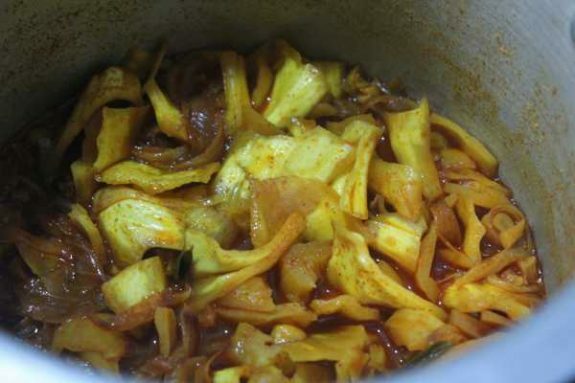 Clean and cut raw jack fruit into small pieces. Cut the beef into small pieces and clean with water. Heat 3 tsp of coconut oil in a cooker and add chopped onion, ginger garlic paste, salt, curry leaves and chopped green chilly. 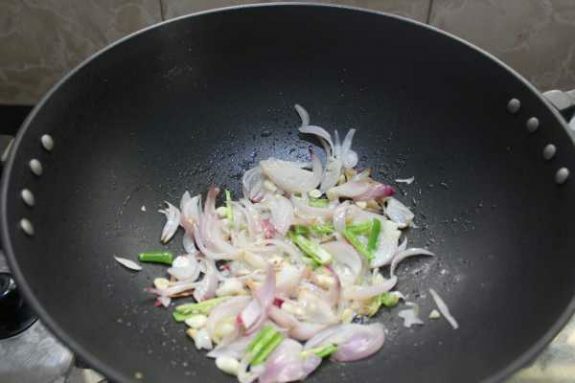 Saute until the onion become light golden brown. 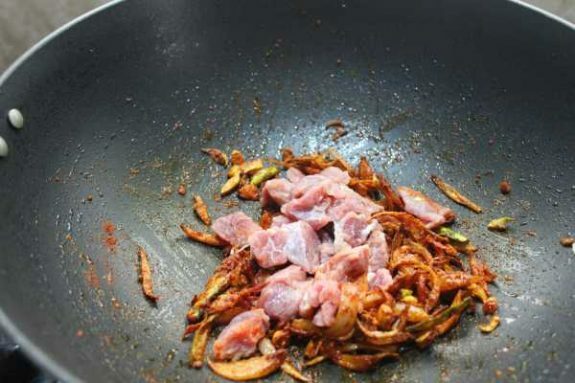 Then add beef into it and saute well. 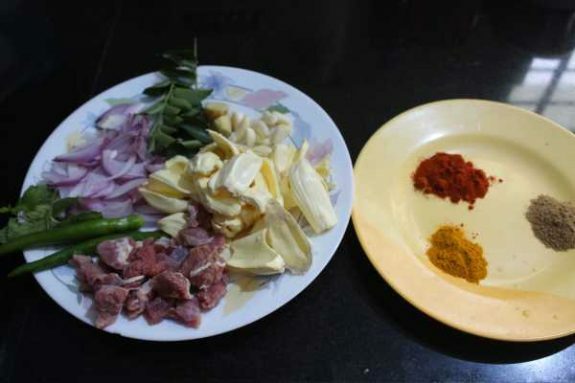 Add red chilly powder, turmeric Powder, coriander powder, pepper powder and garam masala and saute it on low flame. Add 200 ml of water into it and cook for 3 whistle. Switch off the flame. 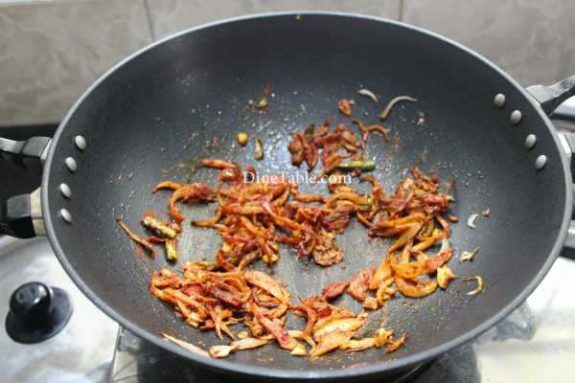 After 10 minutes, open the lid of the cooker and add chopped jack fruits. Cook again for another 2 whistles. Switch off the flame. 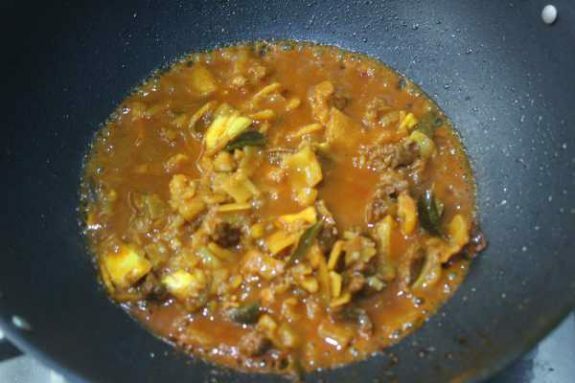 After 10 minutes, open the lid of the cooker and mix well and cook for few more minutes. Check the salt and cook until water evaporates completely. Switch off the flame. 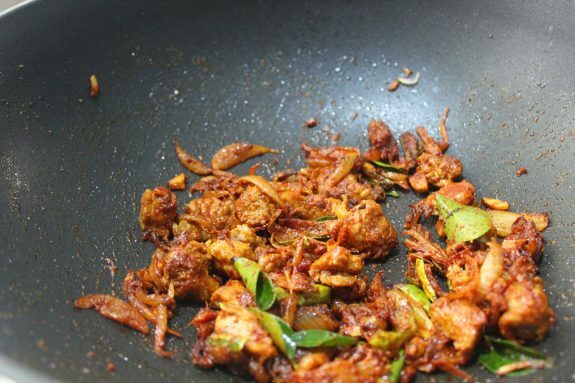 Heat coconut oil in a pan and add chopped shallots and curry leaves. 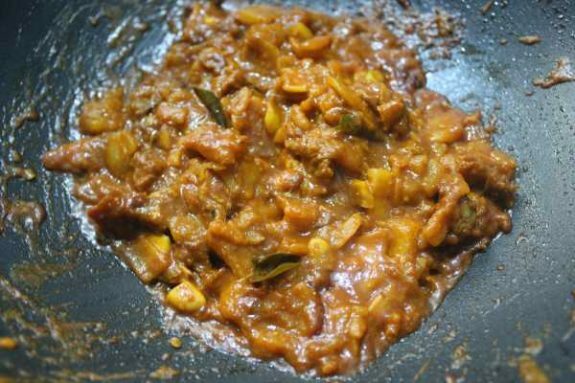 Saute well for 3 minutes on a low flame and pour it into jack fruit beef mixture and mix well. 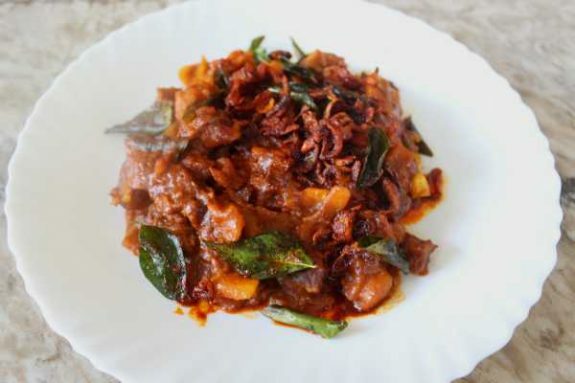 Tasty Jack Fruit Beef Curry is ready.